One single alarming, unlikely thought nagged at me incessantly during Daniel Espinosa’s slick, hyper-edited Training-Day-meets-The-Bourne-Supremacy mash-up Safe House — a thought I never dreamed I’d have: Boy, I really wish Denzel’s usual collaborator Tony Scott had directed this nonsense! For at least Scott, a shameless four-decade veteran of flashy, enjoyable trash such as Unstoppable, Enemy of the State and Man on Fire, would have injected his own brand of off-beat stylistic weirdness and hyperkinetic razzle-dazzle into these beyond routine proceedings. Under his heavy guiding hand, we might have at least been treated to a delicious fromage-scented symphony of ludicrous idiocy, as opposed to this weary, derivative dirge of spy thriller cliches. 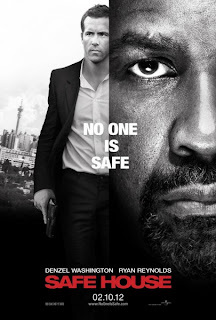 Set in vibrant Cape Town, South Africa, Safe House stars Denzel Washington as Tobin Frost (a stellar movie name, if ever there was one), an awesomely formidable CIA super-agent gone rogue. How formidable, you ask? We’re told — in appropriately solemn, awed tones — that he’s “the most brilliant operative” the CIA has seen. Wanted on four continents for espionage, he’s also single-handedly responsible for sending multiple highly-trained agents into permanent retirement from life. Yup, he’s that good! And now, without warning, he’s casually walked into the American consulate and surrendered to the not unreasonably shocked authorities. Frost, of course, has ulterior motives for giving up the chase. He’s carrying a secret with him in the form of a self-injected capsule of information that threatens to expose all of the intelligence community’s dirty little secrets, and there’s a deadly hit squad of hired guns viciously nipping at his heals to recover it. Transported to a long-vacant nearby safe house for aggressive questioning, Frost finds himself explosively thrust into the care of the site’s inexperienced overseer Matt Weston (Ryan Reynolds) after the pursuing assassins blast their way through the facility’s (strangely modest) defences. Soon the unfairly matched duo are on a mad dash from certain death, with Weston doggedly trying to locate a new secure location to accommodate his unpredictable charge, while the wily Frost, plotting his own escape, attempts to worm his way into the untested agent’s increasingly taxed mind. 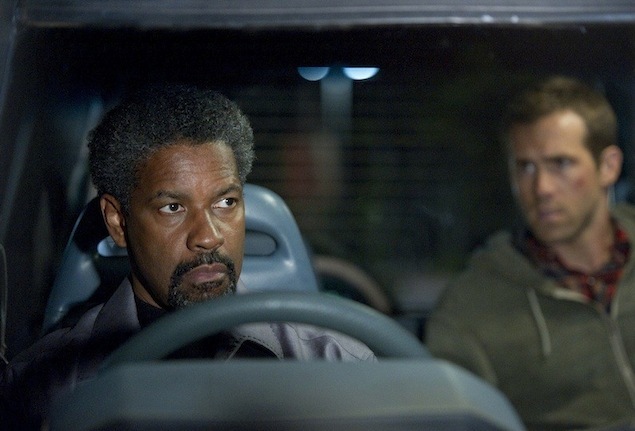 Cribbing heavily from Antoine Fuqua’s Training Day playbook, director Espinosa attempts to recapture that film’s fierce, memorable Crafty Mentor vs. Naive Protege dynamic, but sacrifices character in favour of frantic action spectacle and hackneyed scenes of energy-sapping exposition. 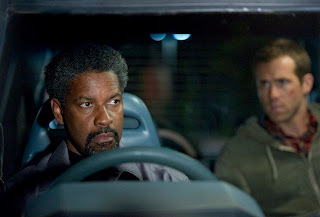 Safe House's script, by David Guggenheim, relies purely on shallow dramatic shorthand, shoe-horning in all-too-brief “character moments” without properly developing the rocky relationship between its two polar opposite leading men. There’s no natural progression of their life-changing battle of wills, only a handful of awkward conversations in between bouts of fisticuffs, and by journey’s end they still feel like total strangers. Frost, who, we learn, rewrote the rules of CIA interrogation, boasts to Weston that he’s in his head and in total control, but the film stops frustratingly short of actually exploring the extent of the senior agent’s manipulative powers, or highlighting their powerful effects. Reynolds’ taciturn hero’s transformation appears to be informed less by actual psychological torment than by repeated vicious blows to the noggin. A cautionary tip to screenwriters: if you’re going to write a dumbed-down script, don’t repeatedly emphasize the brilliance of its characters without any evidence of said brilliance! Given the pedestrian nature of the material, it’s tough to place much blame on the actors for failing to register in their rain puddle-deep roles. Washington, who inexplicably helped shepherd this project to fruition as an executive producer, is doing a pretty shameless variation on his Training Day/American Gangster charismatic villain persona. But he’s fun to watch and, because we know this character so well from his better past efforts, we project more onto Frost than is actually present. Reynolds, however, isn’t so lucky. Continuing his troubling career transition from magnetic scene-stealer to vanilla movie star, the charismatic actor is rendered inert by his sweat-streaked void of a protagonist, grunting and wincing his way through the entire picture. He shows admirable physicality here — we believe he’s capable of the violent feats of daring-do on-screen — but there’s no inner fire, and no reason to invest ourselves in this handsome blank. Filling out the cast as CIA higher-ups, Brendan Gleeson, Vera Farmiga and Sam Shepard — an invaluable combination that, in a film with ambition, would inspire spectacular pyrotechnics — are criminally wasted in nothing parts, tediously debating whether Reynolds’ Weston is on their side or not. Overseeing his first major Hollywood production, Swedish import Espinosa seems timid to establish his own unique directorial voice. Instead, he approximates Paul Greengrass’s queasy Bourne shaky-cam — a conceit that’s fast becoming a crutch for helmers incapable of staging coherent action — with terribly mixed results. An early car chase, which memorably begins with Frost locked in a trunk, has pounding, propulsive momentum, but as the film continues the set-pieces become progressively sloppier. A night-time pursuit through a crowded shantytown is a confusing headache of epileptic editing, and the confined-quarter climax involving shoot-outs and bruising martial arts clashes jumps around too much to build any intensity. Compounding the visual ugliness, Espinosa and Bourne cinematographer Oliver Wood smear every frame with sickly grey and brown bleariness, as if the unfolding events were being viewed through the eyes of the stumbling town drunk. There’s just so little to latch on to in this film; it’s such a bland, middle-of-the-road offering, filled with paycheck-cashing actors in full-on slum mode, that it doesn’t even manage to offend. Free of surprises — the third act mystery bad-guy reveal can easily be predicted by observing the ancient rules of typecasting — or anything resembling a creative spark, it’s a vapour of an action picture; dissipating immediately from memory once the credits begin to roll. Joylessly wasting talent and countless resources, Safe House crumbles under the sorry weight of its own shoddy construction. *Originally published at Converge Magazine. Epi-Cast: Episode 33 - "An Oscarmoron"